La Carretera de los Yungas was, probably, the most famous road in the world as well as the most dangerous. 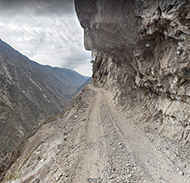 This gravel dirt track covers a 69-kilometre (43 mi) stretch between La Paz and Coroico, in the Yungas region of Bolivia. 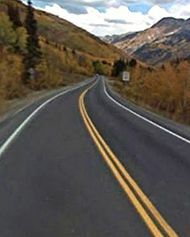 In the state of Colorado of the United States of America there’s a special highway built in the late 1880's: the Million Dollar Highway, part of the San Juan Skyway. It's one of the nation’s most spectacular drives. You'll be on the "outside" for a while with a hell of a view to your right (let the passenger look. You'll want to watch the road). Forget standard driving safety measures like guardrails and shoulders, there aren't any on this stretch, so swerving off the road is not advised! 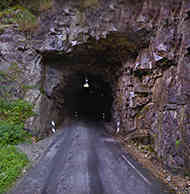 The Leh-Manali Highway is a high mountain road situated in India. It spans over a length of 479 km (298 mi) among the Himalaya mountain range. 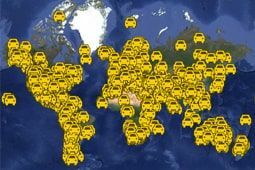 It passes through some of the world’s highest mountain passes in the world, with a mean altitude in between 2 to 3 miles above sea level. Uncertain weather, high altitude, extreme cold and no civilization for miles make this a very treacherous track. Carry extra fuel and feel close to heaven. The Furka pass is a high mountain pass at an elevation of 2.431 m (7,976ft) above the sea level, located in one of the snowiest regions in Switzerland. It’s one of the world's most iconic, exhilarating and exciting drives, through the Swiss Alps. The pass was imortalised by the Aston DB5 / Ford Mustang car chase in James Bond's Goldfinger. It's one of the highest mountain roads of the Alps. 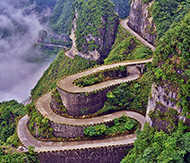 Located within the Tianmen Mountain National Park, in northwestern Hunan Province, China, the Tianmen Shan Big Gate Road (also called the Tianmen Winding Mountain Road) is 11 kilometres (6.8 mi) long from the bottom to the top. 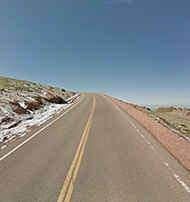 The highest point of the road is at 1.300m above sea level, and the lowest point is 200m. The construction of the road took eight years, finishing in 2006. Fairy Meadows Road is a spectacular and dangerous high mountain track with a length of 16,2km, located in the Gilgit-Baltistan region of Pakistan. The gravel road is completely unmaintained, there are no guardrails to protect you, and it gets so narrow that near the end you’ll have to cover the last section by walking or biking. 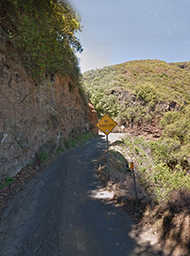 Drivers must remain cautious as the pass has been known to claim the lives of careless drivers. Kahekili Highway is a strip of one-lane paved road framed by rock on one side and sheer cliff drops on the other with a length of 20 miles from Kapalua to Wailuku. 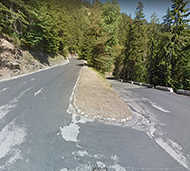 It’s a legendary road known for its snaking turns, narrow passages, and dangerous road conditions, though nowadays that last factor is gone, since the road was completely repaved not too long ago. Col du Chaussy is a high mountain pass, at an elevation of 1.533m (5,029ft) above the sea level, traversed by the D77B road, located in the Savoie department in the Rhône-Alpes region in south-eastern France.The road to reach the summit starts with the famous “lacets de Montvernier”, a special 3 km stretch with 17 hairpins as the road virtually climbs a cliff. It's an improbable road clinging to the edge of the cliff. It's one of the most scenic drives in the world. The Mokee (or Moki) Dugway, located on Utah Route 261 just north of Mexican Hat, Utah is a staggering, graded dirt switchback road carved into the face of the cliff edge of Cedar Mesa. 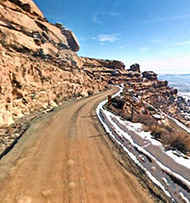 It consists of 3 miles of steep, unpaved, but well graded switchbacks (11% grade), which wind 1,200 feet from Cedar Mesa to the valley floor near Valley of the Gods. The Stelvio Pass is a high mountain pass at an elevation of 2.757m (9,045ft) above the sea level, located in the Ortler Alps in Italy between Stilfs in South Tyrol and Bormio in the province of Sondrio. It's one of the highest mountain roads of Europe. The road itself is a marvel of engineering skill; the exhilarating serpentine sections ask to be driven by experienced drivers for their own sakes. 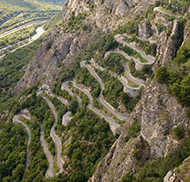 All in all, this could be the most magnificent road pass in Europe. It's one of the most scenic drives in the world. 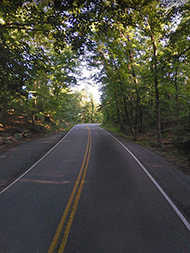 With 318 curves in 11 miles, it's America's number one motorcycle and sports car road. Deals Gap, also known as Tail of the Dragon, is a portion of U.S. Route 129 in Blount County, Tennessee, situated in a gap in Swain County, North Carolina, United States. It's heralded as one of the most scenic drives in USA. 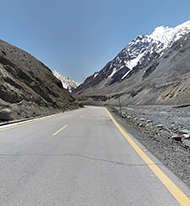 The Karakoram Highway (known informally as the KKH) is said to be the highest paved international road in the world. It's the road to paradise – if you like exploring the mountains, that is. It's regarded as one of the world's hardest alpine climbs. 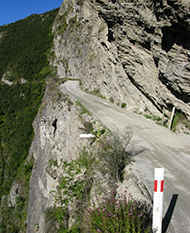 Drive with care as this is a mountain road with hairpin curves and dangerous dropoffs. You might want to take this into consideration if you have passengers that don't like heights. Passage du Gois is a natural passage with a length of 4,3km (2.58-miles), located on the Atlantic coast of France in the Vendée department. 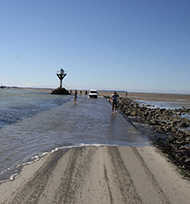 This stretch of the D948 road is periodically flooded leading to the island of Noirmoutier in France. It is flooded twice a day by the high tide. Pack an inflatable boat for driving this 4.3km road because just say for some crazy reason you mix up the tide times, then – like vehicles in the past – you might disappear beneath the salty brine. Located on France’s Atlantic coast, the road floods twice daily with incoming tides and as the tides go out slippery seaweed is left all over it. 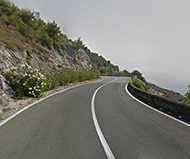 The popular Amalfi Coast route (SS 163 Amalfitana) follows the shoreline from Sorrento south to Salerno, in Italy. Locals recommend planning a drive of the Amalfi Coast during the shoulder tourist seasons, mid-September to October and May, when the road is less crowded and lumbering tour buses are fewer. It's one of the best coastal drives in the world. Picturesque Amalfi has been featured in films for as long as cameras have rolled at 24 frames per second. Pikes Peak, cheesily called “America's Mountain", is a a high mountain peak at an elevation of 4.302m (14,115ft) above the sea level, located in the Rocky Mountains in El Paso County in the United States of America. Along the way you’ll encounter some of the most breathtaking scenery in the world as you wind your way through an alpine wonderland of scenic beauty, mountain reservoirs, beyond timberline, overtaking the clouds… It's one of the highest roads of the USA. The Col de Turini is a mountain pass at an elevation of 1.607m (5,272ft) above the sea level, in the Alps in the department of Alpes-Maritimes in France. It's one of the most scenic drives in the world. Helter skelter corners and changeable weather conditions mean this road is far from safe. Lethal in bad weather, this road can often be covered in snow and ice making it one of the most treacherous roads in the world.